Yeah, I know, the blog is quiet. And it will remain this way for a while. This year, the Setouchi Triennale is taking place and I’m quite busy with it, both online and offline. However, I did manage to find some time for drawing last week. Remember my idea to draw kanji in a way that depicts both their meaning and the way they look. It means “collapse” (and it reads “kuzure”… maybe). As I mentioned in the original post, the drawing won’t always be the historical origins of the kanji. Here we have a mountain above two moons. Honestly, I’m not sure why, but the way it looks made me think of a castle with collapsing walls. In case you’re wondering, this drawing is made from three different pictures. The castle and its walls are Marugame Castle, one of the last remaining original castles in Japan. The two collapsed walls come from Kumamoto castle that was badly damaged after an earthquake in 2016. 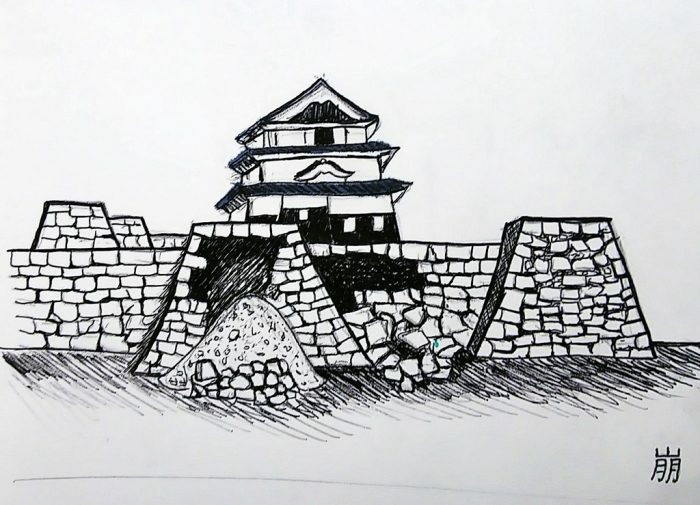 Note that Marugame castle’s wall also partially collapsed last summer because of the heavy rains that struck Japan last summer, but it was another part of the wall, not this one. There, you know everything about this drawing now.